For the past two weeks, the CSA boxes have been really full with up to 16 different vegetables, not including herbs and garlic! We cleaned out the last of the early summer cabbage and the first beetroot and carrot plantings, had a great broccoli crop, a bumper harvest of beans and a rocket planting that never seemed to end. We love loading these heavy boxes into the cooler and wonder what will be created in kitchens around the peninsula. We have had a few emails regarding what's left in the vegetable drawer as members get ready for this weeks box. Here are some of the ways we have found to preserve the harvest - fermentation, condiments, freezing and jarring. Last year, I wrote a post on Preserving, Fermenting and Freezing which may also lend some inspiration. It has a list of some of my favourite preserving books. These suggestions range from very simple to requiring a bit more time and effort. It really helps to keep a supply of jars and new lids on hand throughout the summer. If you do not have to look and/or clean the jars, you greatly reduce your time. The relish for example takes 1hour and 15 minutes from start to finish. I also tend to stock our pantry with good quality vinegars and any special herbs now so that when I have the produce, I can get started right away. Greens Beans I was passed on a traditional New England recipe for Dilly Beans. I usually make at least one batch as they are a fun addition to an entree platter or you can make a batch of these Spicy Dilly Beans to stir a Bloody Mary. I love adding beans to minestrone soup. So when there is a bumper harvest, I quick freeze them by chopping them into 1 inch pieces, dropping them into boiling water for 2 minutes, quickly transferring them into very cold water and then letting them dry in a colander before bagging them into ziplocks and freezing them. These beans can be thawed and lightly steamed for a vegetable side or added in the last five minutes to a soup. Beetroot Although in these parts, we can harvest beetroot year round, I love having jars of pickled beetroot and beetroot relish to add to summer and winter sandwiches and platters. Canning for a New Generation by Liana Krissoff has a fantastic spiced, pickled beetroot recipe. The vinegar is countered with a touch of honey and then cinnamon sticks, whole allspice berries and peppercorns offer that wonderful spiced scent that is a pickling memory I still hold from my childhood. These beets are a far cry from the sickly sweet ones that used to be served in the diners dotting US1 in my home state of Florida. Beetroot Relish is a great addition to a sandwich and a cheese platter. There are two recipes with the link and they take less then 1 hour and 15 minutes to complete! Cabbage I love sauerkrauts and kimichis and also believe in their health giving benefits. I highly recommend Sador Ellix Katz'sbooks about fermentation. Scythes Australia offer great fermentation pots and other useful tools. I also like a quicker Pickled Red Cabbage recipe which includes a pickling spice mix that I really love. Carrots We have carrots from the beginning of December until about the end of September when it is too cold to germinate more and the ones from winter have gone to seed. I have to admit that I have never frozen or jarred carrots to try and have them for those two months in the middle. But I do love Home-Made Vegetable Stock! Each week starting in mid summer, I make a big pot of stock. Vegetable, chicken, beef - I use whatever I have around and let it simmer for several hours. I freeze it in glass bottling jars. You can also find quart containers from a packaging supply store. It is wonderful to have fresh stock for a myriad of recipes...from gravy to stir-fries to soups. We also juice extra carrots and make a delicious Carrot Mash. Celery Again, as an essential ingredient in stock, I add any extra celery each week into my stock pot or we juice it. Chillies If you love hot sauces or Sweet Chilli Sauce, make your own spicy condiments using pure ingredients! They are usually simpler then the ones you can buy, do not include the myriad of preservatives or corn derivatives and are much tastier. 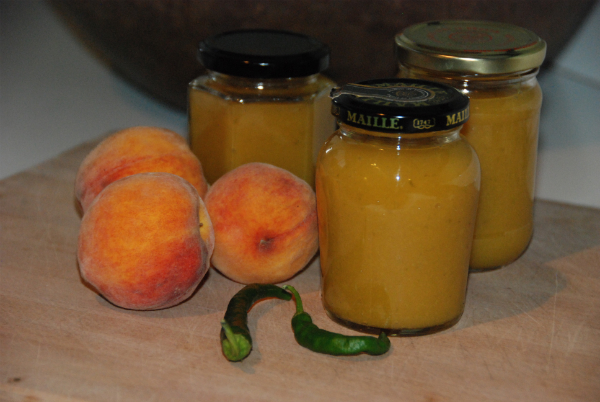 Liana Krissoff offers several hot sauce recipes including the mango and peach hot sauce pictured above. You can also make Curry Pastes and then keep them for at least a month in the refrigerator in an air tight jar or freeze for longer! Cucumbers Fermented Dill Pickles or Sweet Bread and Butter Pickles, I love them all. You can make the bread and butter pickles as refrigerator pickles in small batches and use them within 1 month, thus eliminating the need to seal the jars with a water bath. Both Sandor Katz and Liana Krissoff have wonderful recipes for pickles that range from quick dills to two week naturally fermented ones. Eggplant Nikki Fisher at The Wholefood Mama posted a great Eggplant Pickle recipe from Jay Black. Radishes Again, another vegetable which pickles and ferments into a wonderful accompaniment. I will be trying a beetroot and radish ferment in the next few weeks using Sandor Katz's recommendations and a bit of imagination. I did find this recipe for Pickled Radish which sounded good to me. RocketRocket Pesto freezes well and uses large amounts of rocket! Great way to get all of its wonderful health giving benefits. Tomatoes Now that is a post on its own and, as we are not really to that stage yet, I will leave that for now. Zucchini You can grate zucchini, drain it in a colander and freeze it in bags to add to quiches, slices or zucchini bread all through the winter. You can also slice it, blanch it and freeze it to use in pasta sauces or as a vegetable side. Here is a post on Farmgirl Fare which talks about how to freeze zucchini and summer squash and the many uses for it. Herbs And what about any extra herbs you have each week. A simple thing to do is hang the whole bunch upside down in a cool and shaded spot of the kitchen. When the plant has completely dried, separate the herb from the stalk or stem, ensure that it is completely dried (or put onto a baking tray and leave on top of an oven that is cooling...NOT in the oven) and jar the herbs. These fresh herbs will be far fresher dried then anything you can buy. You can also freeze Basil Pesto for simple dinners and yummy pizzas throughout the winter. Make it omitting the cheese and freeze in glass jars or ziplock bags.